To explore and enjoy Peru, we offer different kinds of tailormade travels. These offers are only some sample itineraries of a much wider variety of possible tailor made travels in Peru, the Amazon rainforest & the Cordillera de los Andes. Extensions to the Galapagos islands, to the Bolivian Amazon, the Uyunyi saltflat, the Atacama desert in Chili and Eastern Islands and the Salta region in Argentina can be all added. This trip can be tailor-made and departures can be arranged all year. Best time to travel is between March and December. The sample itinerary below can be modified to your personal wishes including departure date, duration, accommodation used & how long you spend in each destination. Price: Ask for a customized trip & quotation for a Peru holiday. We can take you to the mystical south of Peru - a fascinating country with a great variety of landscapes and ecosystems, and a rich heritage of pre-colombian culture hidden in the mountains or deserted plains. The south of Peru is an area in Latin America with a different energy & vibration. 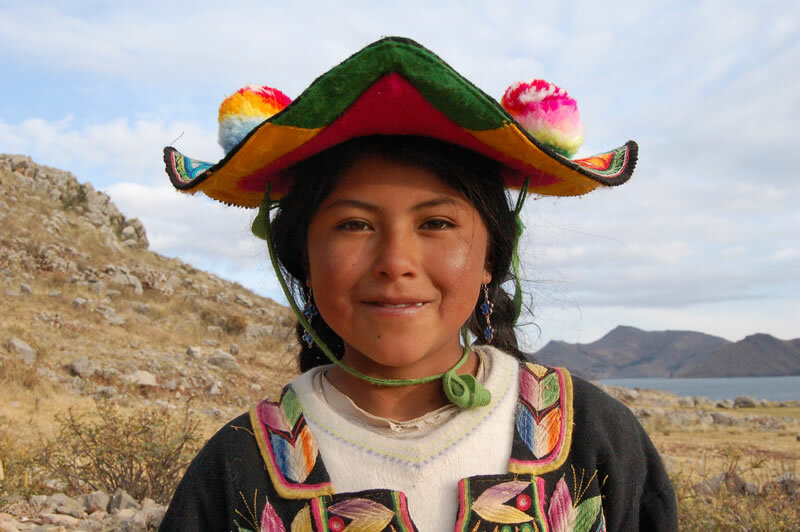 The Andes & Indian people show and teach us something that is very worthwhile to experience. The people, the spiritual heritage of their ancestors, and the places you visit, will make this a special journey. For small organized groups we offer our guiding services through South Peru, including daywalks, excursions, visits to archaeological sites, the Inca trail & other trails. This trip is suitable for couples, friends and families alike - you will be accompanied by an expert on Andean nature & culture. Ask for a quotation. You can walk along the coastline of Paracas, take a dive from a beach in the ocean & visit the large colonies of birds and sealions in Islas Ballestas. You visit the mysterious geometrical figures and lines of Nazca and explore one of the deepest canyons of the world, the Colca canyon, for several days. We can take you to Lake Titicaca and the inspiring city of Cusco, from where we offer several possibilities for trekking or daywalks. You can choose among others between the Inca trail, Lares trail or other trails and even decide for a rainforest extension in the national park of Manu or Tambopata near Puerto Maldonado. And on the end of the trip you can have either free days in Cusco extra, to immerse yourself in citylife, go into nature, visit a social project or just to give yourself an extra holiday break before returning home, or fly back from Puerto Maldonado after a rainforest extension to Lima. This Travel is Tailor made & guided between the period from April till December for small organized groups. Ask for a quotation. This travel takes you to the mystical south of Peru. Peru is a fascinating country with a great variety of landscapes and ecosystems, and a very rich heritage of pre-colombian culture hidden in the mountains or left in deserted plains. we explore the magnificent landscapes of Peru, walk there where others already have returned in a standard tourist tour, and give you the opportunity to immerse yourself in the daily life & meet the very friendly people of Peru. You can discover many different aspects of Peru in this 25 days journey. We walk along the coastline of Paracas & visit the large colonies of birds and sealions in Islas Ballestas. We visit the mysterious geometrical figures and lines of Nazca and explore one of the deepest canyons of the world, the Colca canyon, for several days. We offer an original program on the Titicaca lake, sleep on one of the islands and of course we visit the inspiring city of Cusco, from where we offer several possibilities for trekking or daywalks. You can choose among others between the Inca trail or Lares trail of 4 days, and even decide for a rainforest extension in the national park of Manu or the reservate of Tambo Candamo. And on the end of the trip you have two days in Cusco extra, to immerse yourself in citylife, go into nature, visit a social project, take spanish classes or just to give yourself an extra holiday break before returning home. To understand Peru & the Indian culture on a deeper level, you need to enter into the direct experience of Peru. Reading a guidebook or contracting regular touroperators might not bring you to a true understanding of the reality behind the cultural heritage of Peru. The guides of Latinamerica Journeys have the interest for this direct experience, which will enrich your holiday & might lead you to another way of looking. We invite you to discover Peru in a different way. The Inca Trail, permits & alternatives: the classical 4 day Inca Trail to Machu Picchu is one of the most famous treks in the world. The appeal of this particular trek is the stunning combination of Inca ruins, magnificent mountains, exotic vegetation and extraordinary ecological variety. The trail goes over high passes with unforgettable views, through cloud forest, and finally into subtropical vegetation. After the trail you can choose to return to Ollantaytambo on day 4 and stay overnight there, to continue to Cusco, or stay one night longer in Aguas Calientes and return on the 5th day - giving more time to explore Machu Picchu, the hot baths of Aquas Calientes, climb the mountain Putu Kusi and visit the waterfalls & botanical garden Mandor in the surrounding area. On contacting us we can check directly the Inca Trail permit availability for you. Note that the rain season may start in December, lasts until end of March and that the Inca trail is closed in the month February. In case the classical Inca trail is fully booked there are several alternative trails possible, as the 4 day Lares trail or the Salkantay Inca trail which leads you in 5 days to Aquas Calientes beneath Machu Picchu without the requirement of a permit. Besides there is a short Inca trail program of 2 days called the Camino Real which requires a permit same as the classical Inca trail. More trekkings and trails we offer are the Ausangate trekking in 4 to 5 days, the Ausangate Sibinacocha trekking in 7 to 8 days, the classical Choquequirao trekking, the Juchujqosqo trek from 2-3 days from Tambomachay to Calca, Alpamayo, Cordillera Blanca & Cordillera Huayhuash treks and a few more new trails. The most challenging Inca trekking we can offer is from Cachora to Choquequirao and from there continue via Yanama to the Inca site Vitcos (Yurak Rumi, described as White Rock by Hiram Bingham) in the Vilcabamba valley from where you continue through the mountains and rainforest to Santa Theresa and Machu Picchu. Roundtrip South Peru. All transfers & bus tickets can be arranged in advance for you by our agent in Lima, and reservations for the Inca trail have to be confirmed 3 - 4 months ahead in high season. The accommodation is 2 - 3 star Peruvian hotels, all selected for a spectacular view or a specific setting & ambience. If you wish to stay for a few days in more luxurious hotels, eg in Cusco, we can adapt that to your wishes. The itinerary below can be modified to your personal wishes including departure date, duration, accommodation used & how long you spend in each destination. Rainforest extensions to National Park of Manu or NP Tambopata can be arranged from 3-9 days. NEW: The Inca jungle Trail from Cusco to Machu Picchu is a new route which involves biking from Abra Malaga to Santa Marta, walking on 2 newly discovered Inca trails and the highest zipline of South America. The multiple terrain trip, includes recently discovered real Inca paths, archaeological ruins, an 60 km bike downhill on mountain bikes, through the mountains from Abra Malaga to the green valleys below and the jungle base of Santa Maria. On the third day you reach the top of Llactapata with amazing views, flanked by the high peak of the Salkantay. The fourth day, after three nights the trip ends with sunrise at Machu Picchu and return to Cusco by train and bus. Day 1: When you arrive on the airport you will be picked up by your host and brought to your hotel, an ambient colonial house in a quiet resident zone of Lima from where you can make excursions to the old city centre or to Miraflores. The whole program of your travel will be talked over with you personally. Day 2: Transfer Lima-Pisco in the morning by public bus. In the midday, you can make an optional excursion by taxi to the desert of Paracas island and walk along the cliffs & coast. Day 3: Excursion to Ballestas Islands to view the large populations of seabirds and sealions in the morning. After excursion transfer from Pisco to Nazca by public bus. Day 4: Cultural excursion around Nazca in the morning or midday and a flight over the Nazca lines. Flight over Nazca lines is included. By nightbus to Arequipa. Day 5: Free day to visit the colonial city Arequipa and prepare yourself for the 3-day program in the Colca canyon. You stay in a hotel with a beautiful patio and garden. Day 6: Free day to visit the colonial city Arequipa and prepare for the 3-day program to the Colca canyon. Day 7: Transfer from Arequipa to Chivay with private bus. You will have spectacular views and cross a pass of 4700 m altitude. In the late midday, you can take a dive in the thermal bath of Chivay. Day 8: Free day in Chivay or to make a relaxed daywalk through landscape & pittoresque Indian villages along the Colca canyon to acclimatize to the altitude of about 3500 m. Accommodation in Chivay. Day 9: Visit to Cruz del Condor in the early morning. You can see condors ascending on the wind. With a little bit luck, you can see the condors flying over on a few metres distance. When the Condors have reached great altitudes, you are leaving to Chivay-Arequipa again by private bus. Day 10: Transfer from Arquipa to Puno with beautiful views. Puno is situated on the Altiplano (around 4000 m high) from where you will make a 2-day excursion on the Titicaca lake. Day 11-12: You start with a small transfer to the harbour from where you visit by local boat the floating islands of Uros. From here you take off to the island Amantani where you meet your host family for your overnight stay. For a spectacular sunset you can walk to the temples on the top of your island with your guide and celebrate in the evening folkloric dances in the community hall. The next day you are picked up by your boat again to visit Taquile, where you make a small walk over the island, buy some local handicrafts and then return to Puno. Day 13: Transfer from Puno to Cusco with the Inka Express; an itinerary by bus with several interesting cultural stops along the way. Another option is to go by train. Accommodation in Cusco in a hotel with spectacular views over the old city. Day 14: Free day in the ambient Cusco, the former capital of the Inca empire. Time for the preparations for the Inca trail, the Lares trail, or another trail. Day 15-16: You travel to Aguas Calientes, where you may visit the botanical garden or thermal waters. In the early morning on day 16, you go up to Machu Picchu to enjoy the sunrise over the ruins. You have a private guided tour in the morning. You travel back by train to Cusco in the late midday. For those who walk the Inca trail to Machu Picchu in 4 days. The Inca trail is one of the most popular trekkings in Latin America, which brings you through Inca ruins, mountains and tropical mountain forests. 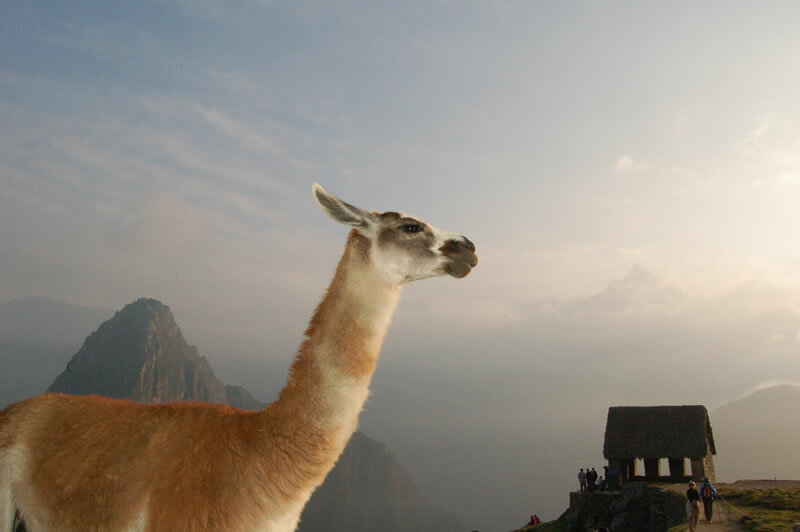 You arrive early in Machu Picchu with sunset and have spectacular views over the ruins and surroundings. You travel back by train to Cusco in the late midday. Day 17 & 18: Free days in Cusco to immerse in city life, to walk and visit the valleys, Inca ruins, local markets and villages in the surroundings of Cusco or to prepare yourself for a visit to the rainforest as extension. Day 19: Flight early morning from Cusco to Lima, leaving you ample of time for connecting you to international flights leaving in the evening. * How this holiday makes a difference? Free day in Lima with a guided excursion to several highlights and visit to the Antropological-Archaelogical museum for those who are interested. Accomodation in a colonial house in the barrio of San Miguel. Transfer in the morning from Lima to our hotel in Pisco. In the midday, we make a walk along the impressive cliffs & coast of the desert of Paracas peninsula. We will have a picknick with a view on the sea and may take a dive in the waters of the Humboldt stream from a beach along our walk. At the end of our walk we can see the sun going down above the desert in a family restaurant at Paracas bay. Excursion by boat to the Ballestas Islands to visit the large populations of seabirds, pinguins and sealions. You can have a close view of these guano islands and its inhabitants. Sealions may follow the boat and look curiously at our presence. After the boat excursion we continue our road to Nazca with a lunch & free time for a walk or sandsurfing in the dunes of Ica. In the late afternoon, we arrive on the plains of Nazca and have our first view of the Nazca lines. Flight over the Nazca lines in the morning or midday depending on weather conditions. Before or after the flight we will have an excursion around Nazca to a viewpoint of some of the geometrical figures, we will visit the intriguing pre-Columbian watercanals and make a small walk through the valley, and we might visit a Nazca pottery & gold extraction factory. Transfer along the desert coast & cliffs untill lunch. After lunch we start climbing from the arid coast to the sierras of Arequipa in the Andes. We arrive in the late midday in our hotel with a beautiful garden & birds. In the evening we take you to a cosy restaurant in the old centre. Free day to visit the colonial city of Arequipa, to just to take a break in the garden of the hotel or enjoy life on one of the most beautiful Plazas de las Armas of Latin America. In the evening we share dinner and immerse in the vivid Peruvian nightlife. Transfer from Arequipa to Chivay with our own bus. We will have spectacular views on snowwhite topped volcanoes and cross a pass of 4700 m altitude. Before that we will have explained you everything about how to adapt to the altitude and feel good. In Chivay you can take some rest in the hotel and garden, and in the late midday, we can take a dive in the thermal bath of Chivay. In the evening we might visit a peña and enjoy the local music and dances of the Colca region. Today we have a relaxed daywalk through the landscape & walk from an autentique Indian village through an unknown part of the Colca canyon. We can take a long break near beautiful carved rock formations and take a swim in the river. This day is to acclimatize further to the altitude of about 3500 m. After the walk of about 5-6 hours including breaks, we return to our accommodation in Chivay. Visit to Cruz del Condor in the early morning. When the sky is clear and the sun heats the air, we can see many condors circling on the wind from their nests up to Cruz del Condor. The condors may even fly over on a few metres distance, one after the other, if the weather conditions are ideal. When the condors have reached higher altitudes we start with our daywalk of 5-6 hours to Cabanaconde, a lively Indian village near the Colca canyon. We will have a picknick with superb views, on the edge of the Colca canyon. 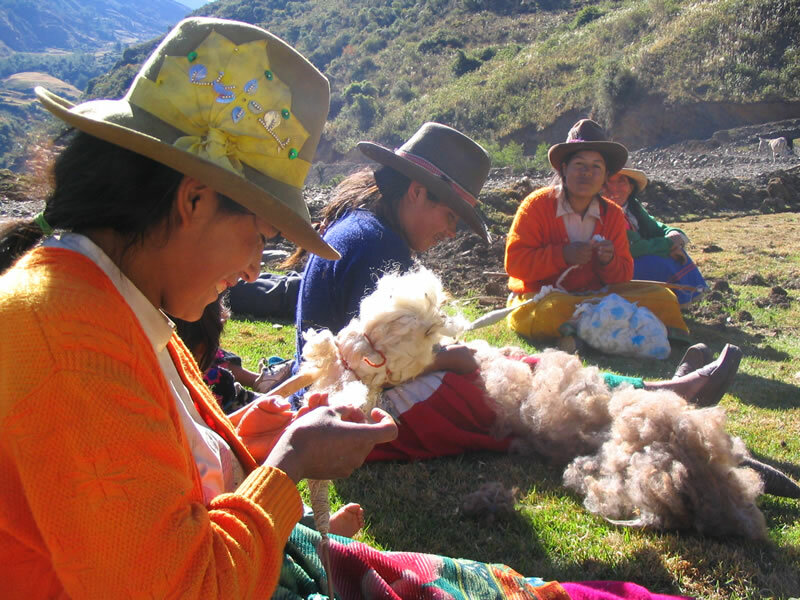 We stay for 2 nights in the sympathic village of Cabanaconde. This day we make a relaxed roundwalk of a few hours, including breaks, on a high altitude pampa (4000 m) with a serene ambiance. We will have spectacular views on several snow topped volcanoes. On the way back we step out of the bus a little before Cabanaconde, taste the rural life and walk into the village to our accommodation. For those who still have some energy left we can play a volleyball game against the local school team on the Plaza de las Armas. We drive from Cabanaconde in the direction of Chivay and pass the Cruz del Condor again. If we have not seen the condors before, due to unfavourable weather conditions, we will have this morning another chance. From here we continue with our own bus, descend on the market of a small village and from there make an easy daywalk across the Colca canyon to the other side. We have picknick near the river and climb from there to a small village with one of the most beautiful colonial churches of the canyon. We return to our accommodation in Chivay and may decide to take a thermal bath again as this is our last opportunity before we go to the Altiplano. Today we travel from Chivay to Puno. By now we are well acclimatized and stop near the highest pass for a small walk to feel the fresh air & energy of the high mountains. 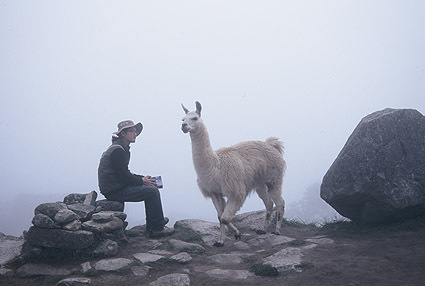 We picknick with beautiful views on the wide landscape, lamas & alpacas of the Altiplano. In the midday we arrive in Puno (around 4000 m high) from where we will make the next days an unique 2-day excursion on the Titicaca lake. We start with a boattrip to Taquile island and go onshore on a not often visited part of the island. We have picknick on a beach and may even take a dive in the lake if the sun is strong enough. We can also lunch with a not often visited community. From here we walk along the island to a small harbour village from where we take off to the island Amantani. We will be received by several members of Amantani families who bring us to several guesthouses. In the later midday we walk to the top of the island and visit the temple of Pacha Mama from where we can have a superb view of the Titicaca lake and surroundings. If the weather is good we stay above until the sun goes down. When we descend to the village, everybody will go to his own guesthouse and will have dinner with their family of the island. The next day we embark for a walk on a remote part of the coastline on a pre-Inca path. After our walk we have a picknick on the beach and can watch sailing ships coming in. From here we are picked up by our boat again, to visit in the late afternoon the Uros floating islands, after which we return to Puno. A travelling day from Puno to Cusco with our own local bus. We will make several cultural excursions along the way. We may visit the tombs of Sillustani and the Inca temple of Viracocha. In the late afternoon we arrive in Cusco. Free day in the ambient Cusco, the former capital and center of the Inca empire, to immerse in city & nightlife, visit some Inca ruins around Cusco, see some colonial churches and museums, go for shopping or just take a break on the rooftop of the hotel with spectacular views over the heart of Cusco. Departure of those who like to walk the Lares trail (and visit Machu Picchu by train). The Lares trail is a 4-day trekking through a mountain area where you cross and camp near authentic indian villages. You most probably will not see many or any other walkers on this trail (in comparison with the Inca trail this is the trail to walk if you prefer to walk in a remote mountain landscape with only a few people). In 4 days you cross two times a pass of a little above 4000 m altitude. You will be guided by a local guide and have a crew of porters, horsemen and one or two cooks. One or two horses always walk behind the group in case someone does not feel well because of the altitude. This normally will not be the case as we have been already around 4000 m high for several days in Puno. Everybody with a good walking condition will be already adapted to the altitude. You walk 5-7 hours a day, including breaks. You travel on day 21 by train to Aguas Calientes and travel from there to Machu Picchu where you meet all the others of your group. Departure of those who walk the Inca trail to Machu Picchu in 4 days. The Inca trail is one of the most popular trekkings in Latin America, and is considered as one of the most beautiful trails. It brings you through Inca ruins, mountains and tropical mountain forests. In 4 days the highest pass you have to cross is a little above 4000 m altitude. You will be guided by a local guide, an assistant guide and have a crew of porters, and one or two cooks. The last day you leave early to see the sunrise at the sungate before entering Machu Picchu. You walk 6-7 hours a day or a little more, depending on your fitness, including breaks. Day 17 is an extra free day in Cusco for the Inca trailers. You have several free days in Cusco to walk and visit the valleys, Inca ruins, local markets and villages in the surroundings of Cusco. You travel on day 20 to Aguas Calientes, where we may visit the botanical garden or thermal waters. In the early morning on day 21, we go to Machu Picchu to enjoy the rise of the sun over the ruins. Visit of the ruins of Machu Picchu and reunion of all participants. The several groups arrive at different times at the entrance; for all groups a local English speaking guide can be arranged. In the midday we lunch all together in Aguas Calientes, and travel by train to Ollantaytambo where we will have our accommodation. In the morning we visit the ruins of Ollantaytambo and the water Inca temple, after which we continue by bus to the pampa plains above the saltpans of Maras. From here, we start walking and have spectacular views on the mountains and the saltpans. We follow a path from the steep slopes of the pampa, and descend in the salt terraces, to see the salt crystals floating on the water and how the people collect the salt. We lunch in the Urubamba valley, and we end the day with a visit to the colourful market of Pisac where you can buy all possible handicrafts and souvenirs, or just enjoy the local food market. Free days in Cusco, which can be used for walking, visiting Inca ruins and/or local markets in the surroundings, spanish classes, immersing and relaxing. Early morning flight from Cusco to Lima to connect to corresponding international flights. Departure for those who have a rainforest extension to the National park of Manu or the reservate of Tambo Candamo.